Classic gifts are timeless for a reason – they always seem to be well received and needed. With cell phones, iPods, and every other electronic gadget under the sun, sometimes we forget that the low tech options can be really good ones. I always love giving a classic wristwatch. This one is just a notch above the ordinary Timex, with all those gears it reminds me of some really cool steampunk timepiece. It really is old school, though, since this one is a wind up. Do kids even know what those are? While we’re styling him up with watches and wallets, a new necklace might be the trifecta. 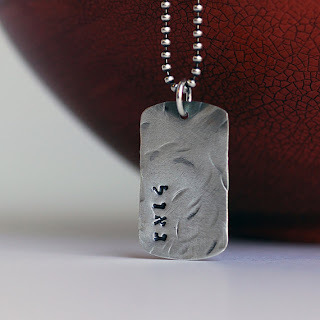 This gorgeous handmade dog tag style necklace is stamped in Hebrew with the word “redeemed.” It’s the perfect message for your teen son/grandson that walks with the Lord. The military style makes it cool, while the reminder of the message is always with him. Life’s Little Instruction Book was written by Jackson Brown, Jr. as a message to his son. It’s one of those classic books that you kind of forget about, but it’s actually the perfect teen gift, since it imparts words of wisdom in small snippets. They’re things you probably taught him, like “Have a firm handshake,” but it’s a great way for them to have the reminder – especially if he’s going to college soon. It’s been in print for more than 20 years, and there’s a reason why it keeps getting published – it’s full of great content! Every young man needs a copy on his bookshelf. Now let’s move on to something a little more fun, shall we? Shower Squids sure fit the “fun” bill! These quirky sea creatures hold their bottles of shampoo, body wash, even bars of soap so they don’t get lost in the abyss of the bathroom. The tentacles slide right on, making it easy to change them out on a whim. If he’s a crooner, chances are he loves at least one of the Beatles. To give him a little grin while he’s pickin’, these Beatles Guitar Picks are oh so cool. No matter if he likes Ringo, Paul, George or John (my personal favorite), they’re as much a conversation pieces as they are a perfect gift for pickers. Boys love listening to loud music, but mom doesn’t generally approve – which is why headphones are so good for the both of you! Lightweight ear buds are perfect for taking on trips or even tucking in the pocket of their hoodies – and Skull Candy makes some really great ones in cool colors that are reasonably priced. They’re always a favorite around here – for boys or girls!